I will be using this item as a favor for the ladies attending the wedding. The scent is subtle but lovely and the tins are perfectly labeled with beautiful coloring. Directions on the back and flavor description on the tin are great for those not familiar with tea. Elegant for a Tea Party Bridal Shower! The bride-to-be loved the dainty design of the tea tins and they look elegant in the medium sized sheer organza favor bags. The personalized names and date of the wedding will serve as a reminder to save the date. Excellent quality! We are thoroughly satisfied with the products and customer service! Having a Bridal Tea for my Niece and these are perfect favors. They're precious and I love the personalization option. Would highly recommend! The wedding tea will be a special favor at the rehearsal dinner for my son's wedding. The tin with inscription is just beautiful and very special. Harney's tea is superb so it is a unique gift which I paired with a friends homemade honey. This is truly a find. This was a great "favor" for our Tea Party Bridal shower. Made a great gift and also a fantastic tea! Also, the customer service I experienced purchasing the tins through Beau Coup was top notch. A few of the tins were dented and they were extremely helpful in sending new ones to replace the damaged ones! We bought these beautiful tea tins as wedding favours. They are very unique, beautifully made and very reasonably priced. We couldn't be happier with them- thank you. I had a Bridal Tea Party for my soon to be daughter-in-law, and I gave these little tins out to the guest as they left the party. Everyone was thrilled and thought they were a perfect gift. I work in the wedding industry and bought these as a thank you gift for my customers. I like the pretty tin and that it is a useful item. I gave this favors in my wedding, it's amazing how people love it. It's original, useful and delicious tea and no one expected this gift. A:This item is defaulted to say "A Tea for Marriage" on the top of the tin and is not able to be changed. A:The tagalongs are a 3 inch circle with a one inch height and the tins are (4x20) are 3 1/4 inch width & diameter and 6 inches in height. Created exclusively for weddings and bridal showers to inspire long lasting happiness, Harney & Sons' bridal tea is an exotic blend of rare white tea, pink rosebuds, vanilla and lemon. White tea is delicate and subtle, and consists of new buds plucked before they open, representing the beginning of a marriage that blossoms over time. These buds have a silvery white appearance and have health benefits similar to those of green tea. 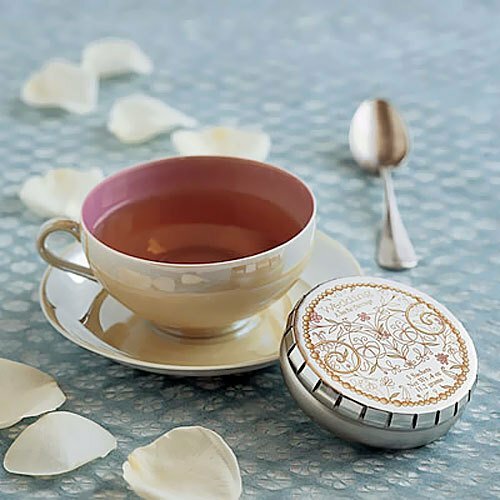 Five silken tea sachets are packaged in a high quality silver tin, embellished with a beautiful bridal design which includes the words "A Tea for Marriage". This is a truly unique and meaningful wedding favor for your guests to take home and enjoy. Also popular for wedding anniversaries and bridal showers. Our bridal tea tins can be personalized, with the couple's first names and wedding date printed on a clear label (please see image to left). Each tin fits perfect in a medium size sheer organza bag. This item is sold in cases of 20 tins.